Liposomal Vitamin C Supports a healthy immune system & reduces the risk for chronic degenerative diseases. Helps protect cells from damage caused by free radicals from exposure to toxins and pollutants. Powerful "antioxidant" in the blood and cellular tissues throughout the body and is vital for the maintenance of good health. Supports collagen production for healthier skin, muscles and joints. Improves the appearance of skin; more supple, improved clarity. Is one of the 50 essential nutrients we need every day for optimal health. Vitamin C, or ascorbic acid, is one of the 50 essential nutrients we need every day for optimal health. 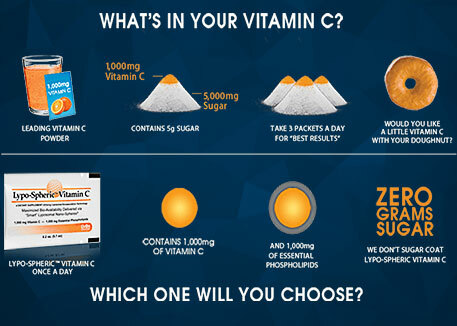 Vitamin C is needed for collagen production, one of the more important structural proteins of the skin, tendons, bone, teeth, cartilage and all other connective tissues. Vitamin C is needed for proper neurotransmitter production, compounds that help to regulate mood, but vitamin C is best known for its role as a powerful antioxidant both in the blood and in tissues & cells throughout the body including the brain. Oxidation is what happens to an apple core when it's exposed to the air; it browns (it rusts). Oxidation of bodily structures like protein, fats, and carbohydrates, found in all tissues and organs, increases inflammation and the risk for chronic degenerative diseases. These are important product facts. Vitamin C helps to prevent and even reverse this from happening by protecting us from free radicals and reactive oxygen species that are generated during normal metabolism, but also from the free radicals through exposure to toxins and pollutants: first or second-hand smoke, exposure to, and the metabolism/breakdown of recreational and prescription drugs, alcohol, air pollution, inflammation from trans fats and diets high in sugar, as well as the toxins produced by viruses, bacteria and other pathogens that our immune is faced with every day. More Liposomal Vitamin C Product Facts. It supports all dietary philosophies: Paleo, Zone, Mediterranean, vegetarian, vegan general healthy eating guidelines (Canada's Food Guide), and more.